Mexico was the last stop on our 7 days Western Caribbean Cruise and I must say it was my favourite stop. Go here to read my review of the 7 days western Caribbean cruise on Carnival Glory. We decided to book the Deluxe Beach, Catamaran Sail & Snorkel excursion with Carnival. With this package it allowed us to sail aboard a 65-ft catamaran, snorkel, enjoy as many margaritas as we could and then relax on their private beach. The cost was $75 USD per person and it was worth every penny. The excursion lasted for about 3 hours. It took us about 20 minutes to get to the area where we would snorkel. Snorkeling was the BEST part of the excursion. Just being able to see the beautiful reef, the fishes swimming by was amazing. The final part of the excursion was the beach. Picture this, a clean private beach with clean changing room facilities that works, free margaritas, being able to choose between a hammock, cabana or a beach chair, water slides and floats and a perfectly clear sky. I was in paradise. There is a free beach at the port. The free beach at the pier has a wonderful view of the cruise ships in port. You can take some amazing pictures here before you go wandering around the port. There is a Fat Tuesday at the port. They have tons of drink specials and it is right near the pier. You can get souvenir cups, enjoy the food, the music and make Mexican memories with your friends. I highly recommend for a group of friends. Fat Tuesdays full? No worries. Three Amigos is within walking distance. It is a restaurant and bar in one. They had a live band and had a more mature crowd. This venue is suitable for the family to dine. Go shopping. 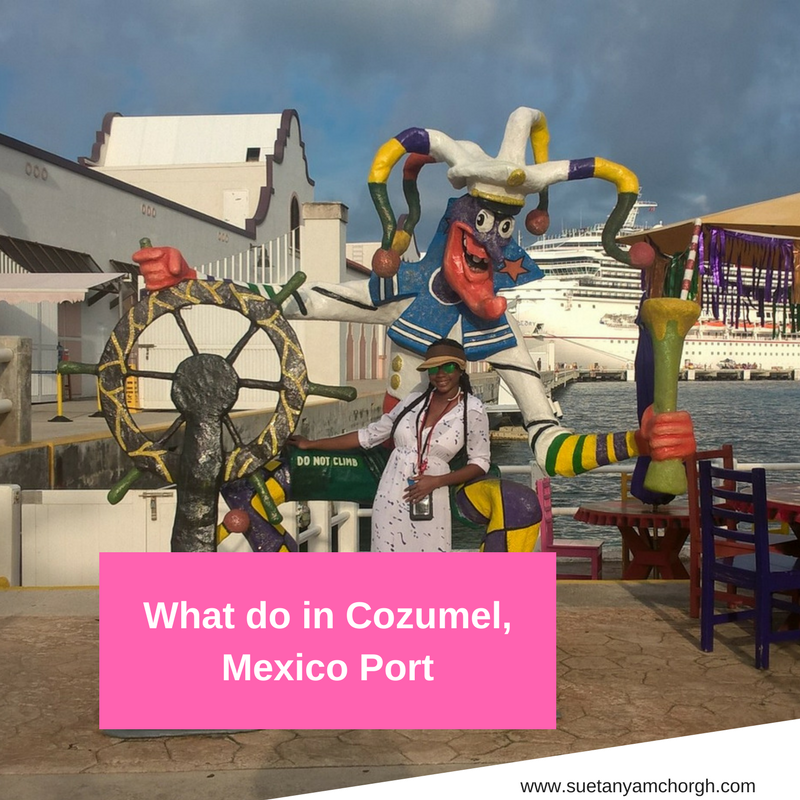 Cozumel offers plenty of duty-free shopping where you can pick up alcohol, souvenirs, hats, shirts, cigarettes, chocolate, jewellery and more at decent prices.